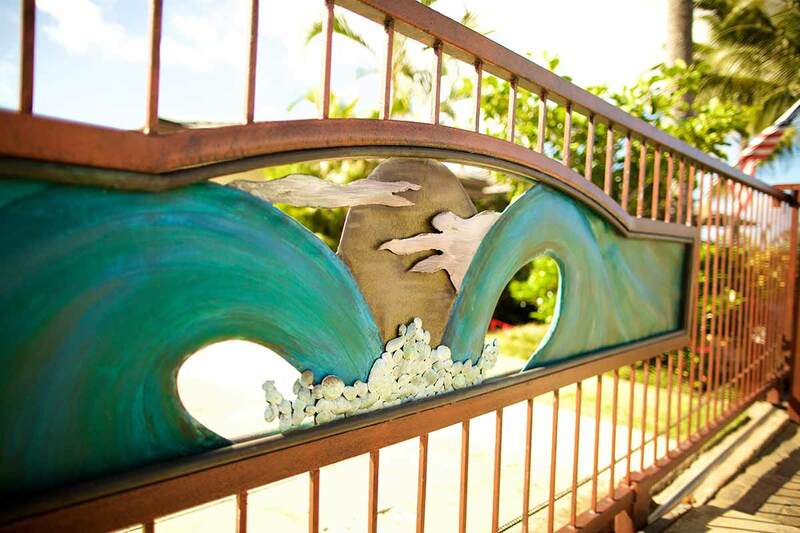 (Mountain to Sea this gate series brings to life the flavors of Hawaii. 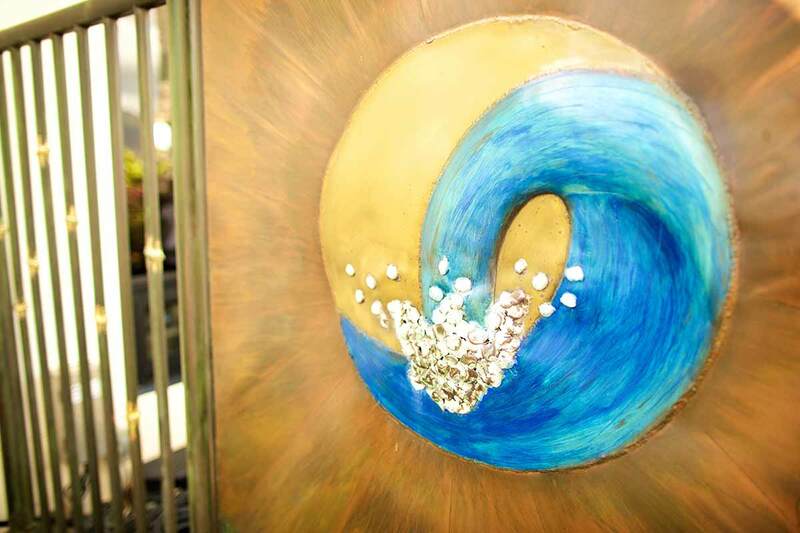 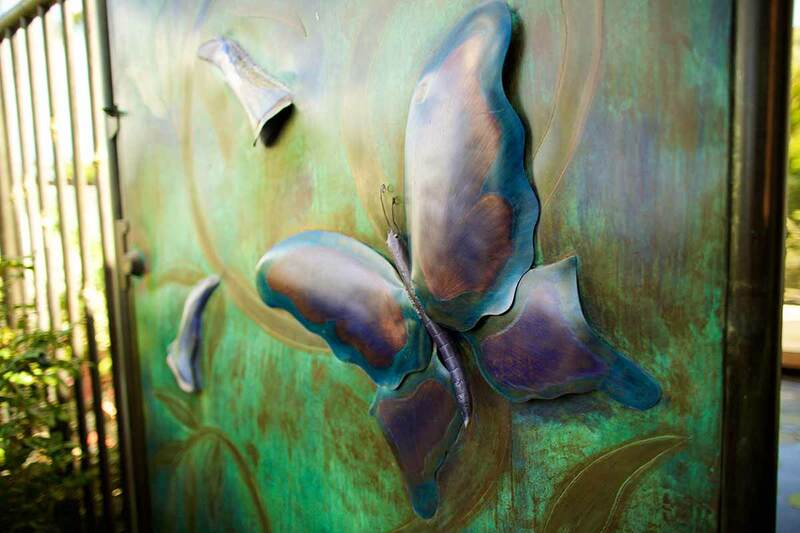 Copper sculptured bamboo, the delicate butterfly and the breaking waves. 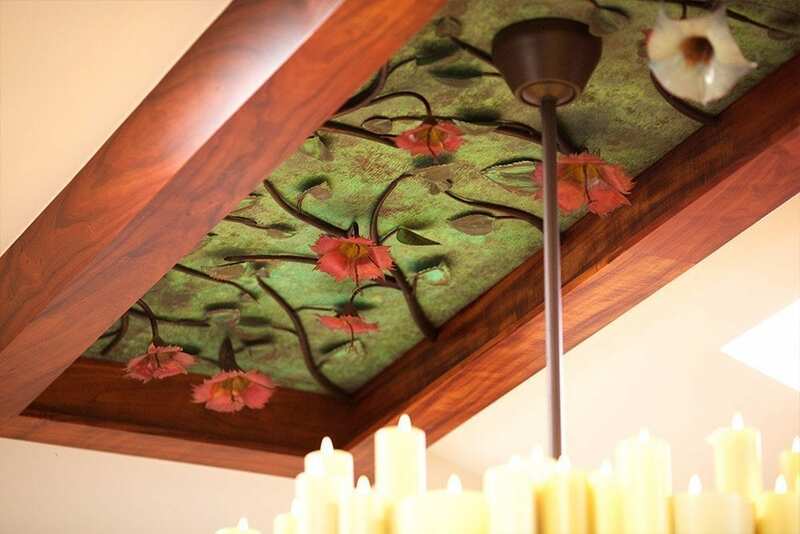 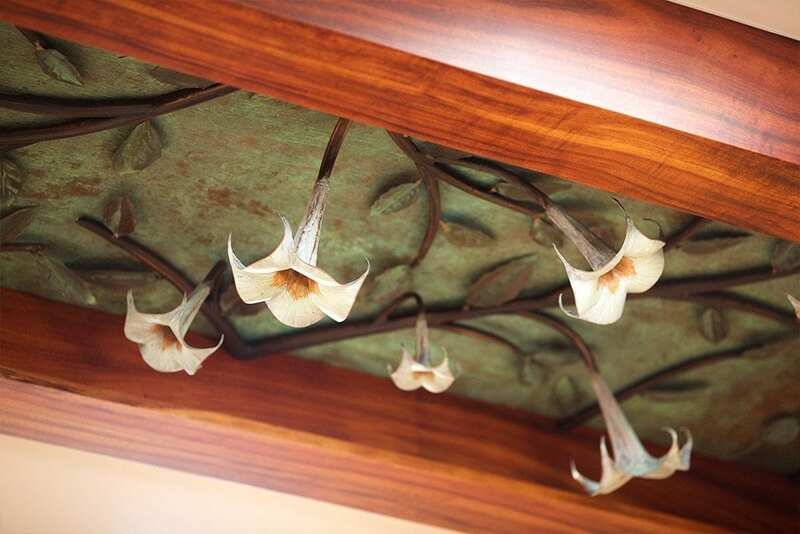 As we incorporate nature into our designs we are more grateful for the world we live in. 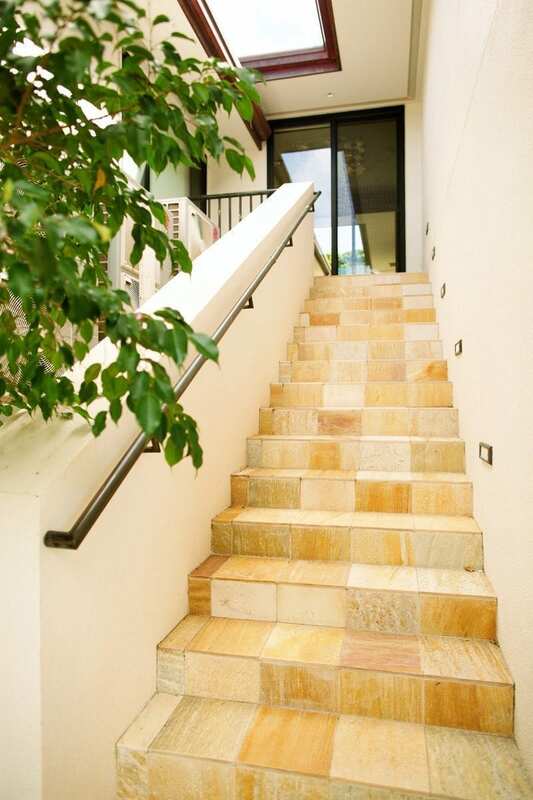 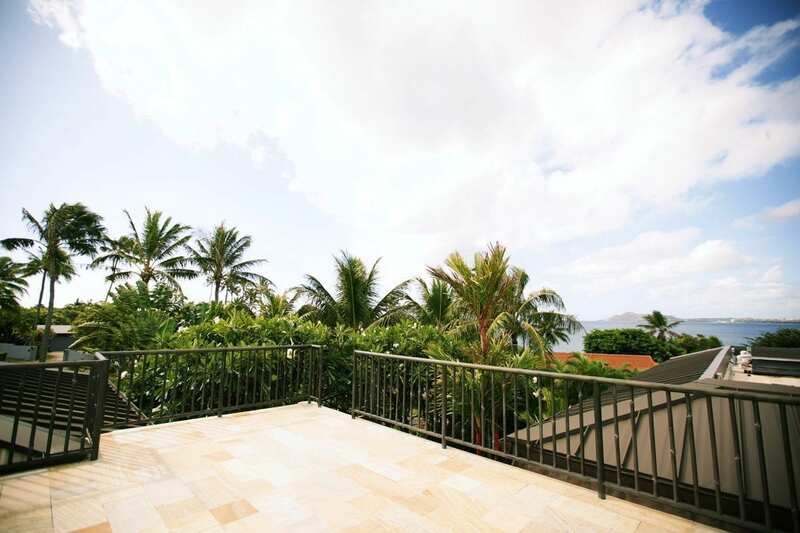 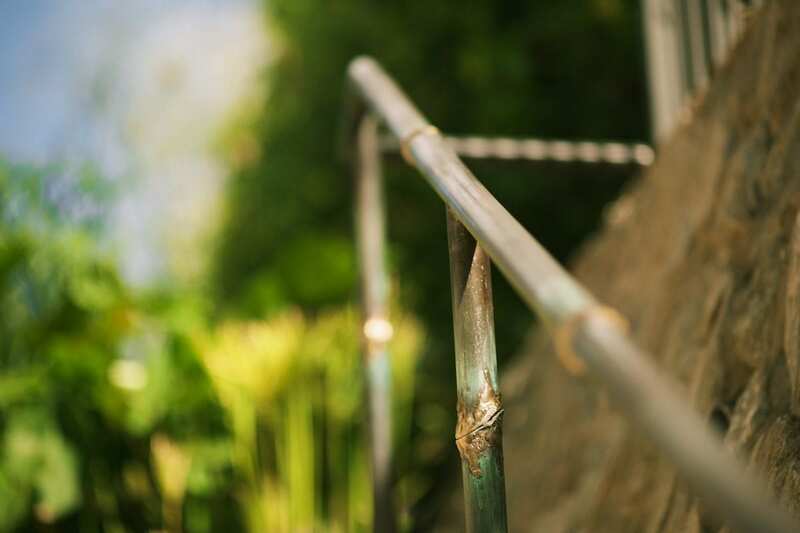 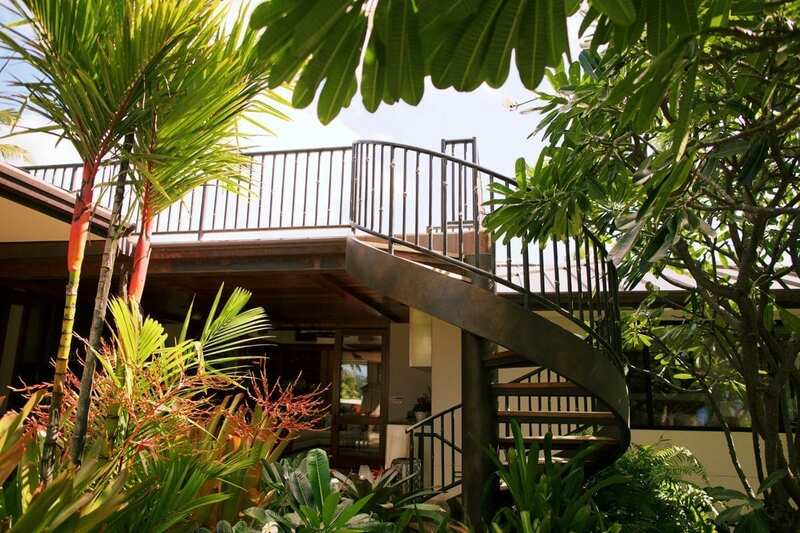 Railings and banisters are an integral part of any property and when done right can add beauty and architectural elements that harmonize with the surrounding atmosphere. 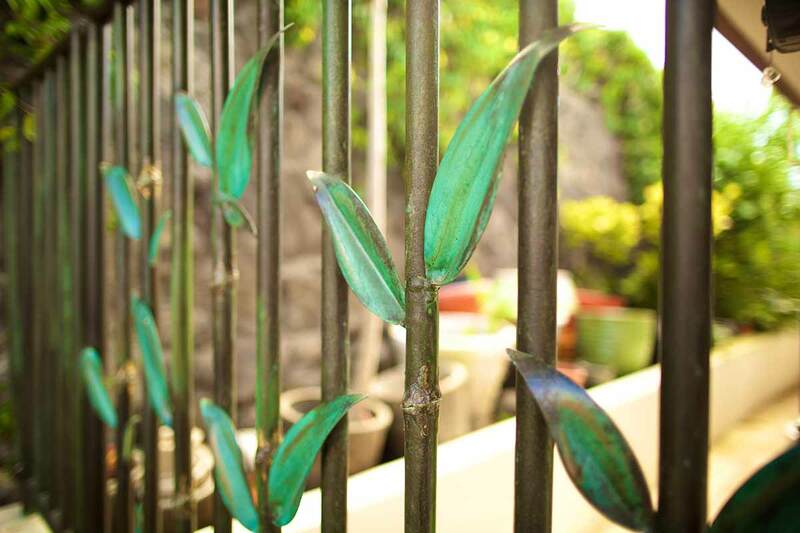 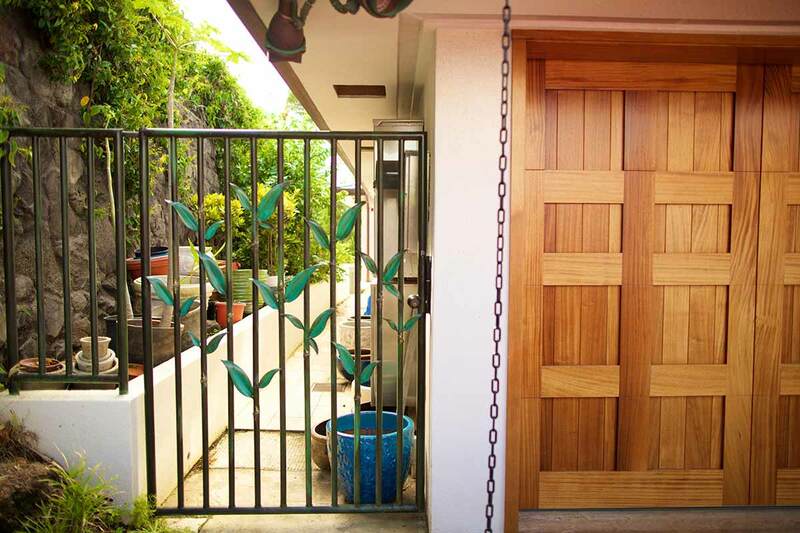 Our copper bamboo is a perfect blend of structure and beauty. 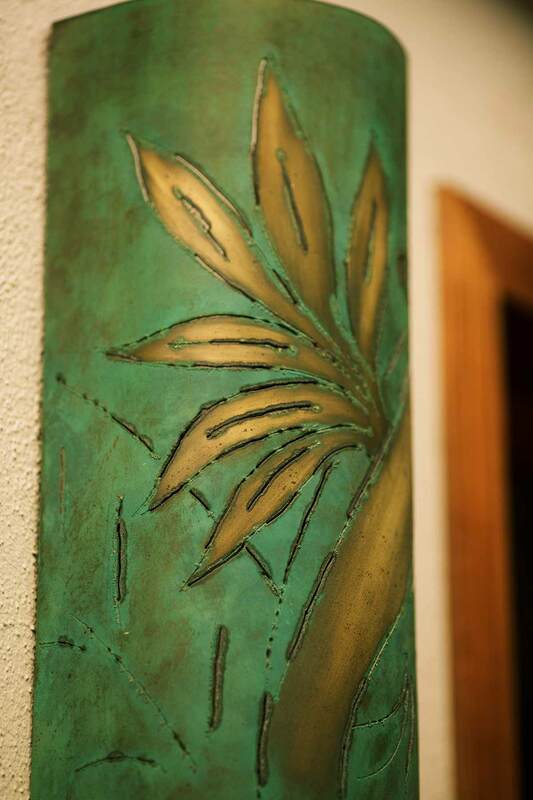 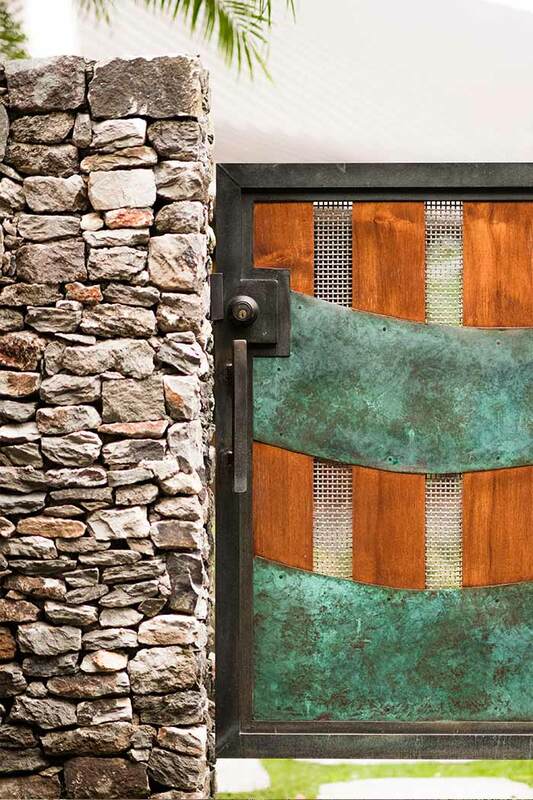 Finished with a bronze and verdigris patina the finish is organic and timeless. 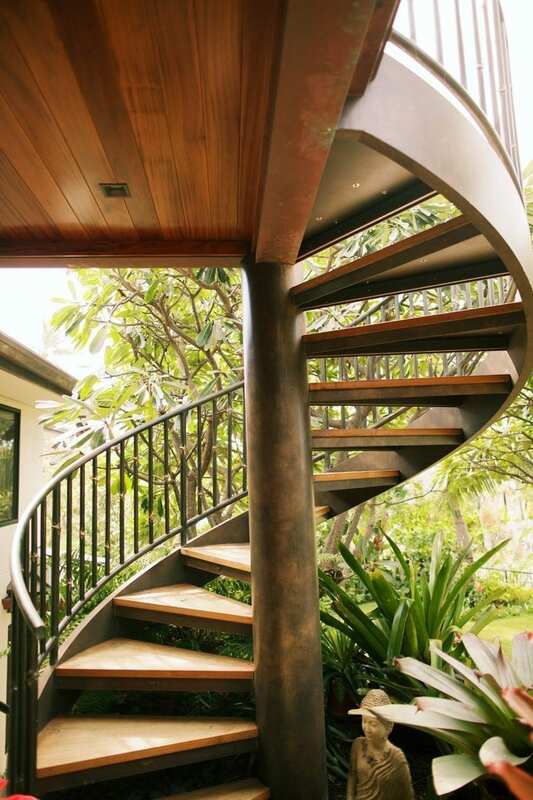 The curvature of the exterior staircase was especially challenging, as everything needed to be fabricated in pieces and then welded in place. 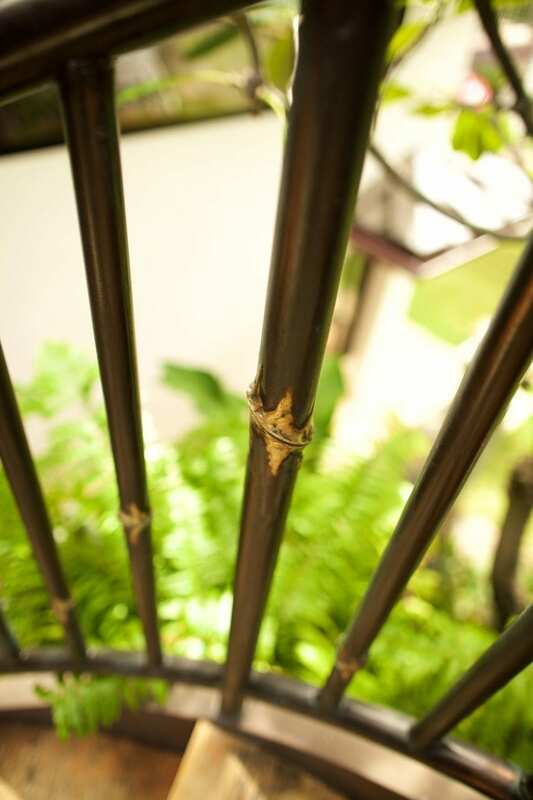 Each vertical baluster was TIG-welded in place, then sanded and finished with our signature bronze and verdigris patina application. 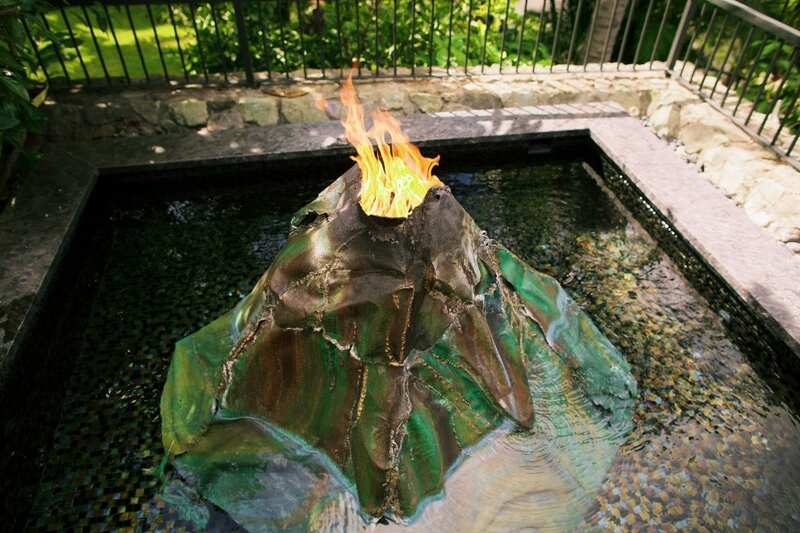 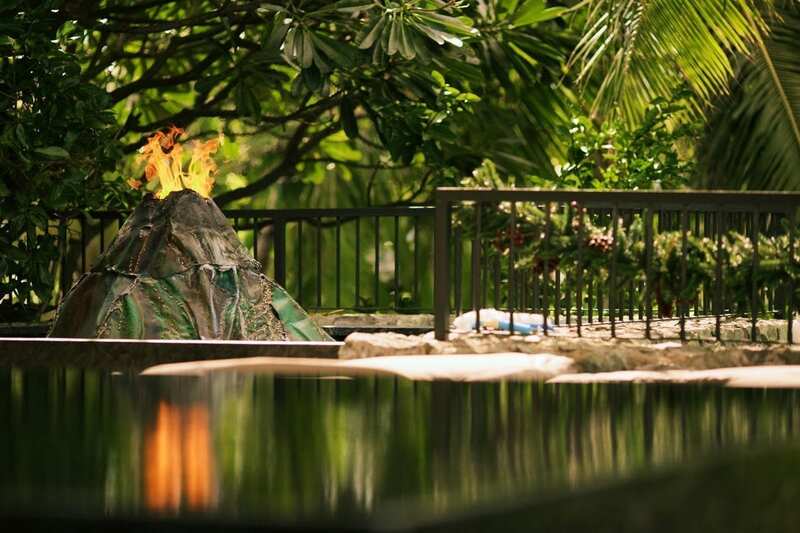 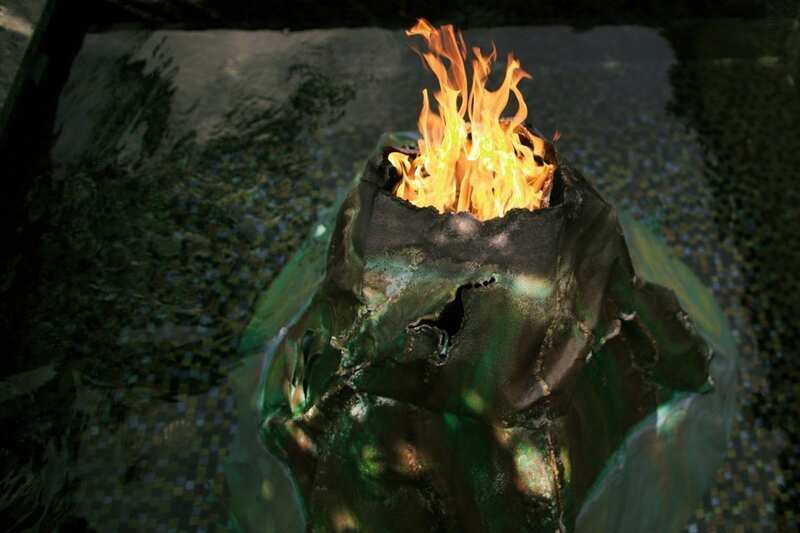 The volcano fire sculpture was really important to the client, as she wanted to create a unique ambiance for after dinner relaxing, as well as a conversation piece. 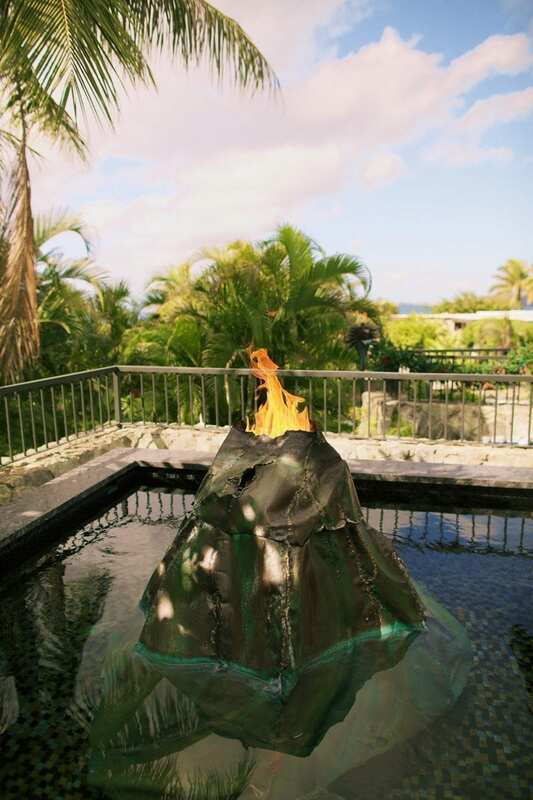 Fully automated with electronic automation, the volcano and the tiki torches can be operated with the push of a button. 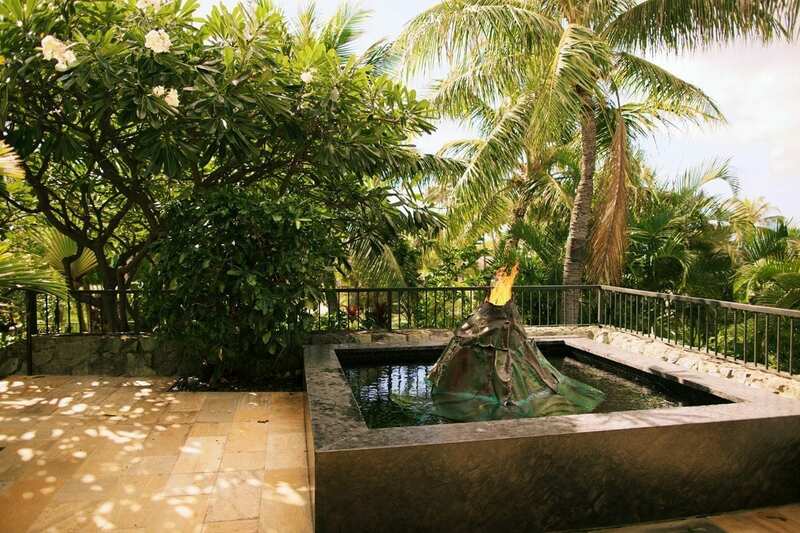 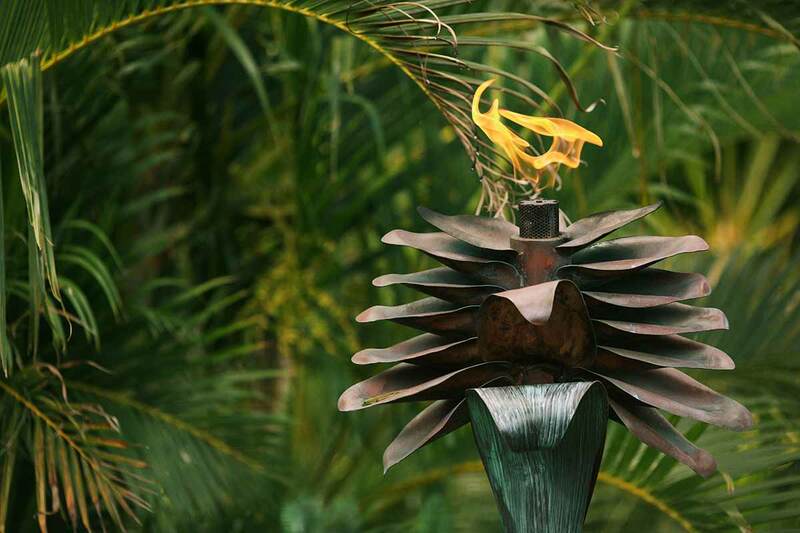 Each of her tiki torches represent a Hawaiian flower that that also grows throughout her property. 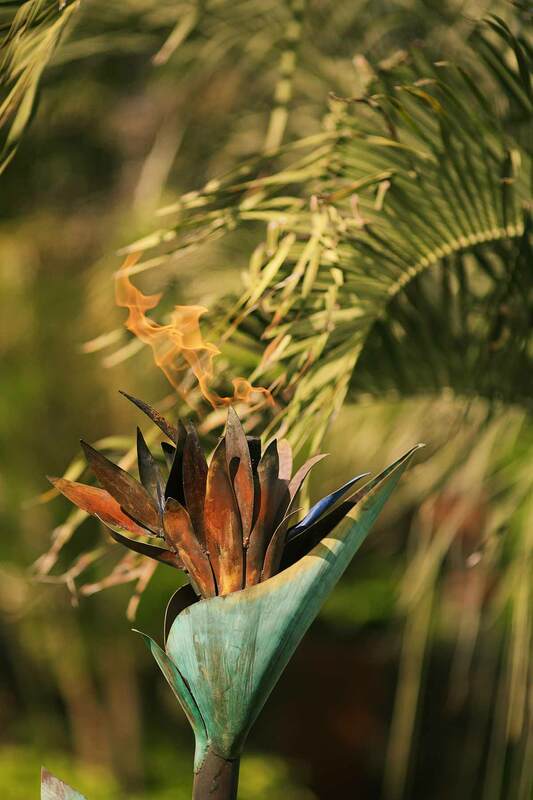 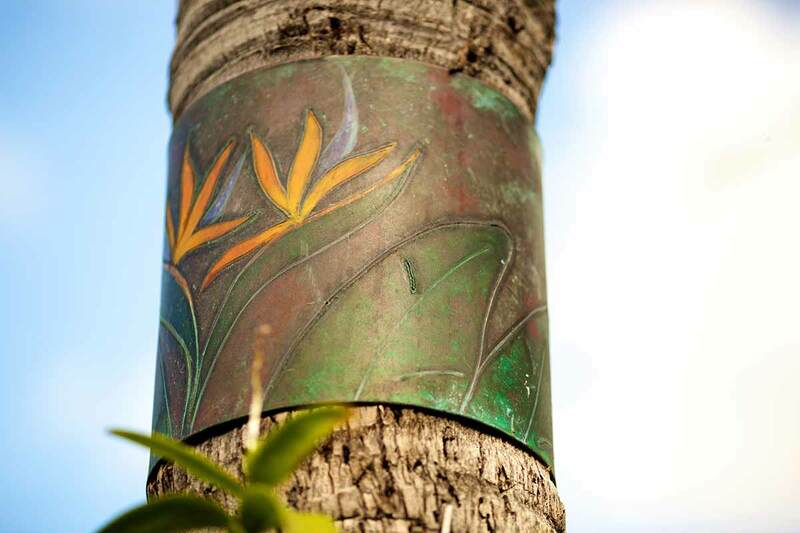 Each one represents a special tropical flower that blooms by day and comes to life at night. 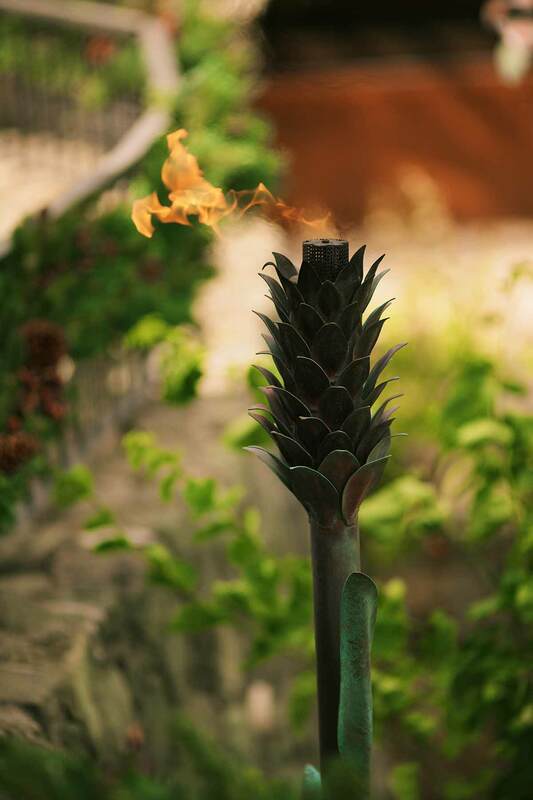 The tiki torches are fully automated can be lit with the push of a button. 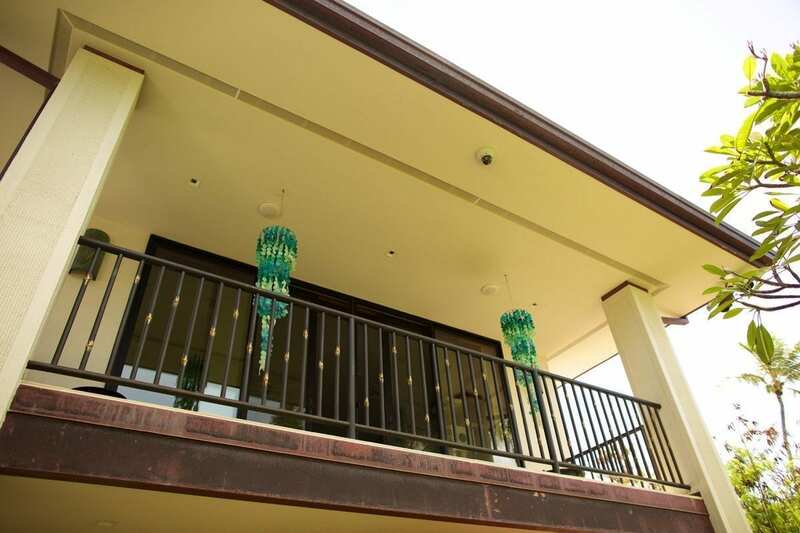 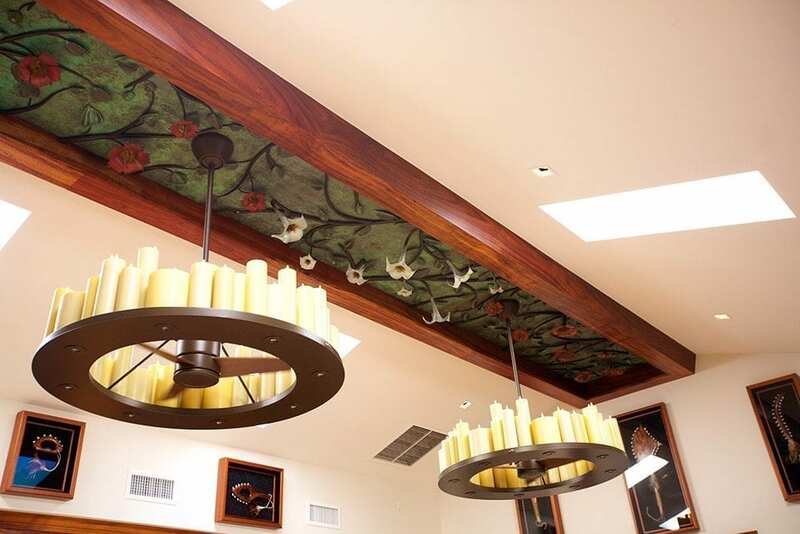 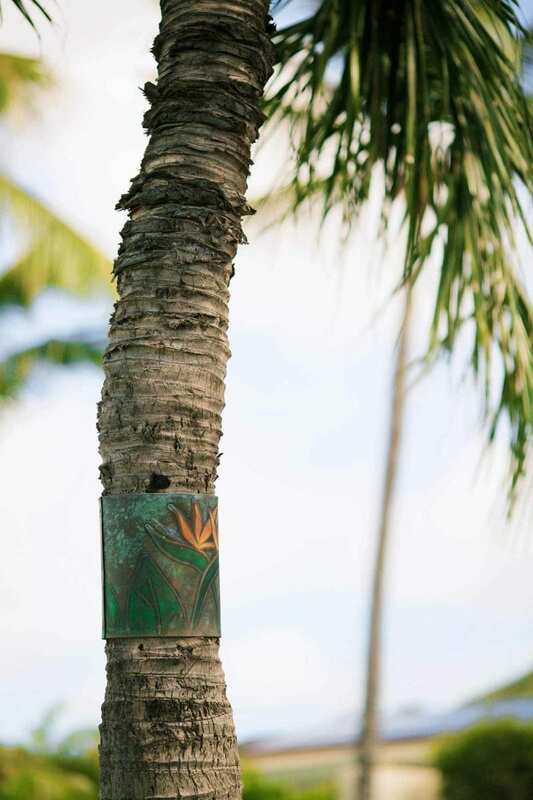 We carried the tropical flower motif into the light fixtures and coconut wraps to carry our theme throughout the property. 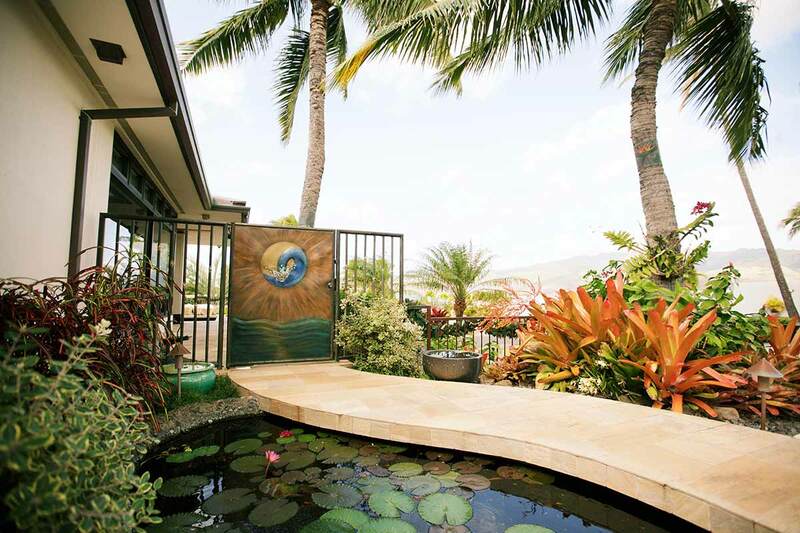 Padilla Designs was commissioned for an estate design project that incorporated custom fabricated teak, brass, and copper gates, unique banisters in a wave pattern that complimented the ocean views, and a “peek a boo” window that added privacy to an outdoor shower while allowing an ocean and sunset view.